It’s hard to believe, but I’ve been doing UofMUSCLE.com for five years. It’s actually five years to-the-date today – which gave me an idea. I thought it might be interesting to look back at what was posted five years ago. This Saturday looks back to the very first UofM post – the M.U.S.C.L.E. Pre-Pack. Looking back, I hate it. The “thumbs” are bigger and the layout isn’t too bad, but you can’t enlarge any of the pictures. The reason for that is simple. Those were the biggest pictures I had at the time. There are some other things about the write-up that I’d like to tweak too. Now that I own a Pre-Pack I need to take some new pictures. I do love that Pre-Pack arch. I know it isn’t as iconic as Muscleman jumping off the ropes, but it is my iconic M.U.S.C.L.E. image. 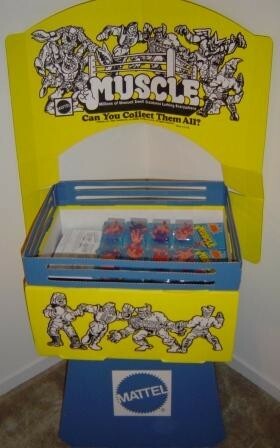 And I would argue the best official M.U.S.C.L.E. art ever produced. 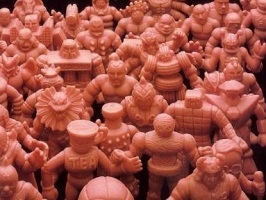 I don’t think M.U.S.C.L.E. collectors could ever come to a consensus and collectively answer that question. I know I would be biased in suggesting my Great Escape 4-Pack. But if I was trying to be objective, then I might suggest Fox and Tortle or Manzilla 2. I just don’t know. What would you suggest? Important Footnote: I don’t need thanks. Ever. I enjoy playing with this site. I was just trying to be funny. I just wanted to make sure that was crystal clear. It is one of my biggest pet peeves when people expect thanks and praise for doing something anything. This entry was posted on Saturday, August 16th, 2014 and is filed under UofM News. You can follow any responses to this entry through RSS 2.0. You can skip to the end and leave a response. Pinging is currently not allowed.